Hooray! Another awesome sponsor to introduce you guys too! And more special offers for Redhead in Raleigh readers! Woohoo! Readers- Meet Maribeth. She's an Independent Consultant with The Pampered Chef. Maribeth- Meet my wonderful readers. They are the best! I have to admit that The Pampered Chef has been a long time love of mine. I remember in college dreaming of the day I'd be "grown up" so that I could get real kitchen stuff for my kitchen. Because real kitchen stuff would just be silly in a dorm, you know? My first The Pampered Chef purchase was the trifle bowl because it is just too awesome not to own. The base stores inside the bowl AND it comes with a lid! Now it is tied for my favorite kitchen item with their muffin pans. 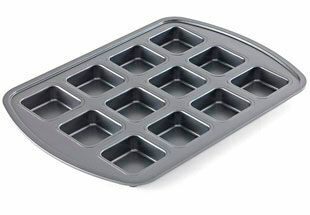 I thought a muffin pan was just a muffin pan. But these cook everything so evenly and are super non-stick. I loved mine so much I actually just bought a second one! 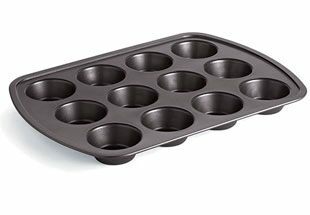 I know it looks like a regular old muffin pan. But there is hidden magicalness. They are just sneaky like that! Anyway, enough with my The Pampered Chef loving. Let's get to know Maribeth! My name is Maribeth Priest. I've been married to my wonderful husband Dave for 6 years on July 8th. We have two beautiful and amazing children, Ryan who is 2 and Ryley who is 8 months. I was an elementary school teacher for 8 years before having Ryan. After he was born, my husband and I decided it would be best for our family if I stayed at home. A little over 18 months later my daughter was born. I am an Independent Consultant with The Pampered Chef. This August I will go back to teaching at Ryan's preschool as a PreK teacher. Both Ryan and Ryley will go with me everyday. It's the best of both worlds! How did you first get involved with The Pampered Chef? I became a consultant with The Pampered Chef a few months after Ryan was born. I attended my neighbor's intro party and thought, "You know what! I think I'm going to do this!" I ran home told my husband that I was going to join and a little over 2 years later I'm still selling and LOVING every minute of being a part of this wonderful company! What is your favorite part about The Pampered Chef? It is very difficult to pick one favorite part about my company! The Pampered Chef is awesome in so many ways. I strongly believe in our products and how they help put dinner on the table easier as well as quicker! I also love the rewards and recognition The Pampered Chef gives their consultants. I've gained friendships with fellow consultants as well as customers. I just cannot say enough about all the wonderful opportunities The Pampered Chef has given me! What is your favorite part about being a Consultant for The Pampered Chef? My favorite part about being a consultant for The Pampered Chef is getting paid to party! Who doesn't love to party and who doesn't love to get paid? They money I've earned through The Pampered Chef has paid for a trip to Disney World, tuition for my son's preschool, and money towards paying bills! 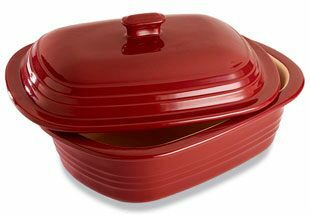 I've always said my favorite product is The Pampered Chef's Deep Covered Baker. YES! I still LOVE this product but my NEW FAVORITE product is our Brownie Pan!! It is soooo much more than JUST a Brownie Pan. Consultants across the nation have developed a recipe book just for the Brownie Pan. There are so many fun and easy recipes that can be made in the Brownie Pan. I am also participating in the "Christmas In July" Open House this Friday, July 27th, and Saturday, July 28th. It is going to be a lot of fun with giveaways and discounted items! I will have a FREE GIFT for all Redhead in Raleigh readers who attend! Just let me the Redhead in Raleigh was the one who sent you! You can reach me by email (MBPCook@gmail.com) or my website (www.pamperedchef.biz/maribethpriest). Want to get in on all the fun of sponsoring Redhead in Raleigh? Then check out the Advertising page for all of the details!